Some people might say I have obsessive-compulsive disorder. I like things to be just so; in line and in order. Everything must be, well … perfect, you know? Archery and bowhunting help me deal with that demon. OCD-ridden minds love the crisp release and swift, straight arrow flight. Even more, I like well-organized lists that get the job done. If you’re a new bowhunter and you’re slightly OCD, you’ve come to the right place. Here’s your bowhunting checklist and pregame archery plan. Bowhunting begins and ends with safety. It isn’t necessarily dangerous, but bowhunting can get treacherous through negligence, ignorance or complacency. Therefore, aspiring bowhunters should enroll in hunter-education and bowhunter-education safety courses. All states require hunter-education certification, but most do not require bowhunter-education certification. Even so, get certified anyway. Knowledge is safety, and you want safety on your side. Besides, if you wish to bowhunt states that require certified training, you’ll be set. Next, get to know your hometown bow shops and archery clubs. Pros who work at bow shops and hang out at clubs generally have deep archery and bowhunting knowledge. Tap into these resources for local wisdom. After that, start communicating with your state’s fish-and-wildlife agency about questions or concerns you might have. Agency professionals can point you toward programs that might aid your bowhunting journey. Don’t stop there. We live in the information age, and the web keeps information at our fingertips. Simply type in what you want to learn and — voilà — instant answers. Do you want to learn about the many moving parts in compound bows? Easy. Need help finding a hunter- education course? Cake. Need directions to your state wildlife agency’s website? Done. The message here? Don’t be afraid to seek help. It’s available and waiting for you. Besides, bowhunting isn’t something you must enjoy on your own. Ours is a brotherhood and sisterhood of like-minded people. Remember that bowhunting equipment doesn’t only consist of a bow and arrows. Additional tools like range finders, bow slings, hunting license, broadheads, and a backpack are just a few of the extras you’ll need. Photo Credit: ATA/Lester Photography. 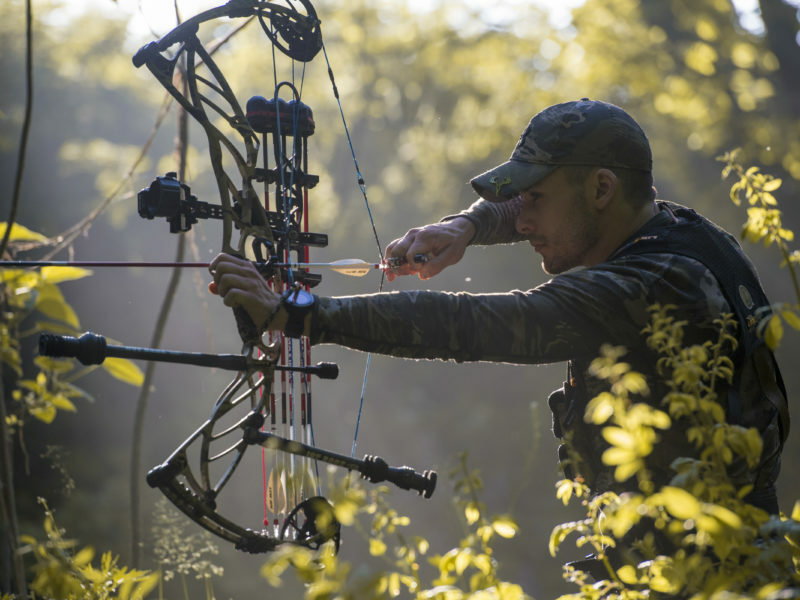 Once you’ve taken your first steps toward bowhunting, it’s time to gear up. Granted, you might feel overwhelmed when listing the basic equipment needed to bowhunt. Give it time. As you learn the products needed to hunt with a compound bow, everything will fall into place. This is the most important gear category. Budget for these items before anything else. Once you have them, begin buying the items in category No. 2. These tools are also important, but you don’t need them to start shooting. You can buy them later, borrow them from a friend, or try them out at a bow shop or archery club. Once you have your basic archery gear, begin buying from category No. 3. This is basic gear you’ll need to hunt. Also, put yourself in real-life hunting situations by practicing from treestands and ground blinds, and place your 3-D target at different angles and distances. Gradually increase your comfort range as your skills improve. Photo Credit: ATA/Lester Photography. Once you’ve assembled your basic gear and absorbed the safety knowledge, start tuning in your bowhunting skills through practice. The cliché “practice makes perfect” is only partly true. It should go, “Perfect practice makes perfect.” Quality practice routines get you there. When on the range, focus on the mechanics of shooting. Form and muscle memory are everything. Taking 10 quality shots is better than racing through 100 bad ones. Ensure a good start and strong foundation by seeking a coach or mentor. And to prepare for the real thing, nothing beats on-the-hunt practice, such as shooting at 3-D animal targets. Also, put yourself in real-life hunting situations by practicing from treestands and ground blinds, and place your 3-D target at different angles and distances. Gradually increase your comfort range as your skills improve. Begin by practicing with field points. As the season nears, start practicing with broadheads. Don’t get discouraged if archery frustrates you at times. Keep it fun and keep practicing. Even the most experienced bowhunters practice regularly, and everyone improves at their own pace. Even if you’re a learned archer already, the big world of bowhunting can expand your options. Bowhunting provides learning opportunities every time you enter the woods. Photo Credit: ATA/Lester Photography. Finding a place to bowhunt is the final step before the hunt itself. Convenient access to bowhunting property can prove challenging, but you can accomplish it on private and public lands. Knocking on doors to ask permission still works, no matter what pessimists might say. Leasing and buying land are certainly options if they fit your budget. If not, many states offer abundant public land for bowhunting. Get with state wildlife agencies for lists of public properties. Also use online resources like Powderhook, onX and other digital resources. Even if you’re a learned archer already, the big world of bowhunting can expand your options. Bowhunting provides learning opportunities every time you enter the woods. For instance, you’ll learn woodsmanship, recognize animal habits and behaviors, and prepare wild game for the table. The list goes on. In fact, the list never ends. The more you learn, the more bowhunting thrills you’ll experience.